Congratulations to Luke who successfully graduated from the rigorous Krav Maga FORCE Training Division Instructor Course. Luke and his wife Melissa are pillars of the CrossFit Amundson community and are beautiful examples of dedication to practice, adherence to values and strength of family. 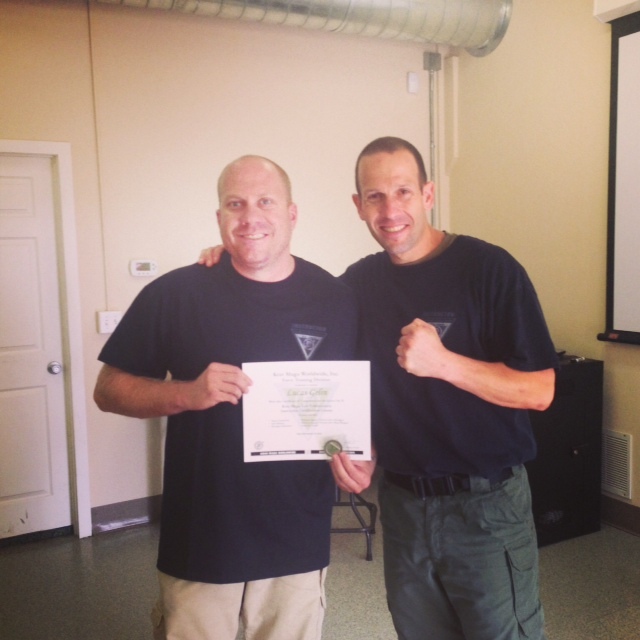 Luke will be joining the Krav Maga Santa Cruz Instructors Team. With Luke’s extensive experience in Military and Law Enforcement Operations, Luke will be an awesome addition instructor, coach and mentor to our Athletes. Congratulations Luke! Did you know enrollment at CrossFit Amundson includes membership at Krav Maga Santa Cruz, the only officially licensed Krav Maga school in Santa Cruz County, and one of the few schools in the entire Northern California area? Krav Maga Santa Cruz is a structured program consisting of 4 phases on instruction and learning, with a comprehensive test at the conclusion of each Phase. Our current Phase A class will test and graduate on October 29, 2014. Family and friends are welcome to attend this special day. The next Phase A class will begin in the middle of November, 2014. Each phase is approximately three months. Due to the high level of physical fitness and conditioning that is part of Krav Maga, at least one month of CrossFit training is required before enrollment in Phase A. If you are interested in starting a course of study in Krav Maga, there will be a sign up at Headquarters this coming week. Please note our gym will be available for Open Gym on Monday, October 13, 2014, from 9:00 AM to 5:00 PM. All formal CrossFit, Yoga and Krav Maga classes will be cancelled for the Holiday. A CrossFit Amundson Coach will be available during Open Gym hours to work on technique, program a workout, or answer questions on the CrossFit Amundson program. Enjoy the Holiday!